CONTACT Richard Guzman at rrguzman@noctrl.edu about speaking on the following topics. His fees vary according to the size of the organizations and events. He often incorporates media and performance into his presentations. Many of his presentations have a Social Change dimension to them, and he regularly speaks on various aspects of social change and on the organizations he is involved in. See the Social Change page on this website. He is also often asked to preach. Go to an example of a sermon, “Sacred Doing,” which approaches social action from a different, more inward, way—a theme he also developed when he spoke at the memorial service of famed poet Carolyn Rodgers. PROFESSIONAL WRITING – For many years Dr. Guzman has spoken, led workshops and conducted multi-session seminars on writing and project development for many organizations—from big service, research, manufacturing, and engineering firms (UPS, Caterpillar, Brown & Root, Bell Labs, etc.) to community organizations, colleges, and governmental groups (Nichols Public Library, North Central College, the Naperville Police Dept., etc.). His ideas are the basis of his book Writing Well Wherever You Work. DIVERSITY & INTERFAITH DIALOGUE – For churches, colleges, companies, and organizations Dr. Guzman has done programs on DIVERSITY, multiculturalism and race relations, and led one of Illinois’ largest school districts (Naperville’s #203) in the development of a diversity plan. He has spoken on Christianity’s relationship to other faiths, and on the Bible as well as the sacred texts of Islam, Hinduism, Buddhism, and Taoism. Among his major college courses is Sacred Texts as Literature (view syllabus). 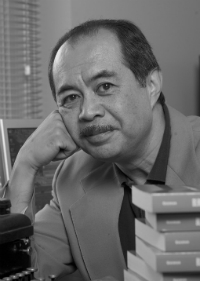 LITERATURE & CULTURE – Based especially on his books Smokestacks & Skyscrapers: An Anthology of Chicago Writing (edited with David Starkey) and Black Writing from Chicago, Dr. Guzman has spoken and performed widely on Chicago writers and Chicago’s great tradition of Black writing. He also speaks about poetry, non-fiction, and several authors from world literature. MUSIC & CULTURE – Dr. Guzman has spoken on the nature, history and cultural impact of jazz, the blues, and rock ‘n’ roll, and on specific performers like Ray Charles, Robert Johnson, Elvis Presley, and others. Some of this material can be found in his first book Voices and Freedoms: A History of Jazz. Good job Doc, i’ll visit again.